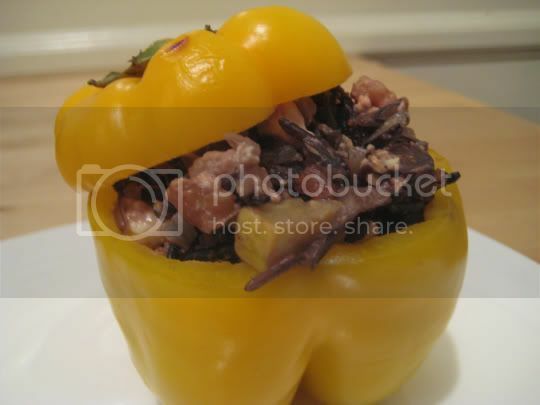 I don't like bell peppers enough (yes, even the mild yellow ones) to eat stuffed peppers, so I'm guilty of only using one for the pic above. In fact, after I took the pic, I emptied the "stuffing" out and ate that by itself. This is a very filling, satisfying recipe, and the flavor is great. The nutty, grainy wild rice mixed with sweet-tart pomegranate juice, crunchy walnuts, salty pungent feta cheese, and sticky sweet dried figs...a Mediterranean delight. Oh yeah, and there's some squash in there too, but that really just added some texture. If you don't want to go through the whole pepper thing, you can bake the rice in a dish, and it would make a fabulous side with maybe...falafels and a side of tzatziki sauce. The rice I ate out of the pepper did have some bell pepper-ish flavor leftover, which I could have done without, but it wasn't terrible. Make again? Yes, without the peppers.